TRU Group Magnesium Team claims the world's strongest experienced-based capability in magnesium metal and downstream products. One of the reasons for this is that TRU Group president and our other expert consultants have spent many years employed in the magnesium industry. There has only been a few small ineffective magnesium smelters built in the west within the last twenty years [despite attempts that were technical failures*] and China still dominates magnesium supply using Pidgeon process technology originally developed in Canada. Our team for years has provided a wide scope of technical and business advice to several operations in China as well as in the West. We have has also been heavily consulted on downstream industries and high tech magnesium-applications in Europe, United States, North America, Japan and Middle East. TRU Group conducted a detailed bankable feasibility study involving all aspects technical, engineering, business and financing of a completely new magnesium metal, alloy and downstream plant [powder, granules, extrusions, parts]. Process developed by TRU Group was a blend of western and Chinese technology. Bankable study included obtaining equipment quotations globally from equipment vendors. Recommended equipment and plant design, marketing & distribution, financial viability and assisted in implementation. This TRU project and similar in the USA and other western countries are ongoing in 2013. For a number of clients TRU magnesium consultants has provided custom magnesium price forecasts through 2013. This TRU Group forecast took into account production cost differences between China and the west, import and dumping duties in the United States, and several other determining factors such as global magnesium supply-demand. TRU Group monitors the magnesium market and is especially in touch with the magnesium industry in China through our strong China Beijing presence. TRU Group magnesium consulting undertook a bankable feasibility study of a magnesium Extrusion and High Pressure Die Casting Plant as part of a magnesium metal smelting and alloy smelter. This involved the TRU Group technical and business team designing and specifying all aspects of the plant. A full business plan requiring bankable feasibility accuracy was prepared. TRU Group Magnesium Team has extensive experience in all aspects of magnesium and magnesium alloy intermediate & downstream processing and end-use applications. We can advise on the most up-to-date innovative technologies and advanced leading edge methods. These include specialty retort-tubes, billet casting, thixomoulding, mag metal powders, spherical magnesium alloy granules for injection moulding and magnesium extrusions. TRU is expert at all magnesium end-uses such as automotive, aerospace and construction. Serpentine - Due Diligence for a Silica Magnesium Project in the Gulf Corporation Council States in which serpentine is the mineral feedstock for multiple plants including magnesium metal (firstly by converting serpentinized ore to carnallite) and specialty silica products - precipitated silica, colloidal silica, fumed silica and silica gel. TRU has developed a plan for further development of the project which is ongoing in 2009. Brucite - Feasibility of a Romanian magnesium smelter that would use local Calcite-Brucite mineral feedstock. TRU has been engaged for some time on technical studies to determine the amenability of the brucite to Pidgeon process production of magnesium metal, as well as undertaking a feasibility study. Calcined lime will also be produced as a by-product for regional construction project. Local coal is being investigated by TRU as an energy source (conversion to coke-oven-gas and coal coke). 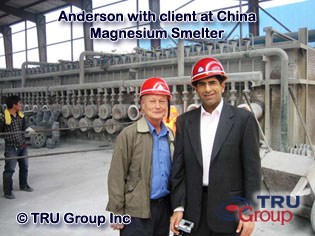 In 2012 TRU is conducting commercial scale pilot testing of the Romanian brucite in China. This Romanian magnesium projects is under new consideration ending 2018 and TRU Group expects to move forward in 2019 with further development of this calcite-brucite magnesium smelter..
TRU Group is expert on magnesium production using conventional pidgeon, silico-thermal, electrolytic, Russian, Dow (sea water brine process) , Chinese, magnola, and western technology as well as the experimental and "improved" processes under development such as Orion Laboratories, Zuliani and MINTEK. We have also studied dolime [intermediate dolomite calcining kiln product], ferrosilicon [required in Pidgeon process magnesium smelting process], retort manufacturing plant design, coal coke-oven-gas / coal gasifier [used extensively in China as the fuel in the retort furnaces], magnesium applications [including lithium-magnesium cells]. TRU Group Magnesium Team has in depth capability in magnesium compounds and Mg chemicals - such as magnesium carbonate, chloride, hydroxide, sulphate, magnesia, lime, specialty cements and refractories. * Beware Technical Failures - they have been widespread and some huge in magnesium. The Magnola Project based on technology engineered by a leading Canadian engineering firm cost Noranda & others $1.3 billion loss. The new (2014-15) Iranian Pidgeon based project does not work. Brine based projects worldwide have underperformed and proved unprofitable. Chinese magnesium brine projects, existing and planned, have all floundered (or likely to fail) and others brine-based in the West closed down - latest casualty predictably is the Dead Sea Magnesium Plant in Israel. The Sabkha Mg Brine Project in the Arabian Gulf also doomed! US Magnesium LLC, Salt Lake City, UT is brine based but (only) makes its money due to import duty protection as the only USA magnesium metal producer. Magnesium technology is tricky and requires the unique strong direct experience of our firm. TRU claims the Worlds Most Qualified Magnesium Team. 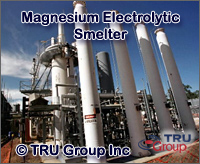 Magnesium smelting is designated a TRU Group Frontier Industry. Our magnesium industry capability is diverse and comprehensive. Our team is made up of distinguished world renown magnesium experts, some with over twenty years direct hands on experience working for magnesium metal producing companies. Edward R. Anderson, B.Sc. (Eng)., Dpl (Marketing Research)., MBA., FCIArb, President TRU Group Inc spent ten years as Director Corporate Planning at Timminco Ltd, the west's only commercial scale Pidgeon process magnesium producer. He is an expert on business, marketing, financial, and the technical aspects of magnesium metal & alloy.